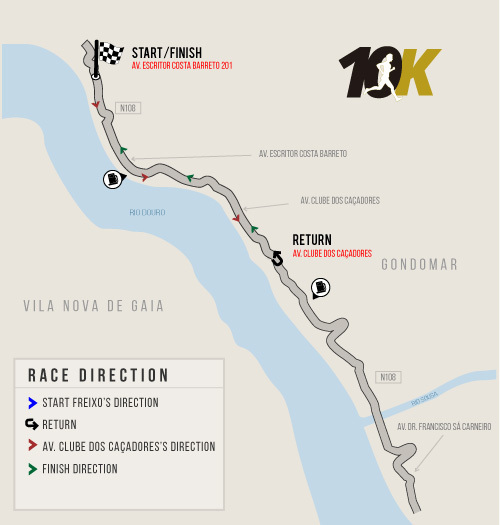 EventSport and the Municipality of Gondomar organize the 6th Edition of the Half-Marathon D`Ouro Run Gondomar by Generali which aims to stimulate sports as an element of health promotion and quality of life. 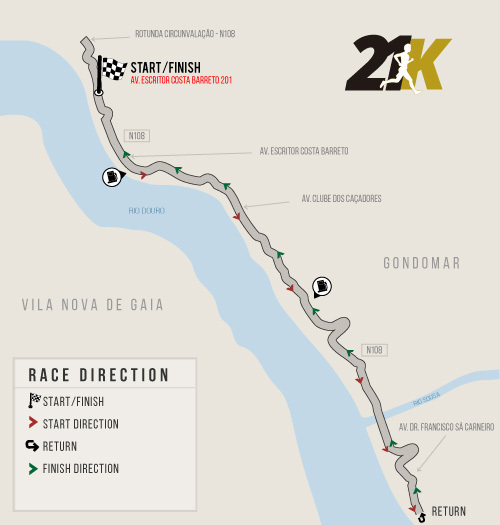 The Half-Marathon of 21 km, Mini-Marathon of 10 km and the Walk of 5 km, will be held on June 9th, 2019, beginning at 10:00 am, the race takes place along the Entre-os-Rios road. All runners of the 21 km and 10 km that cross the finish line legally and are legally registered, will receive a participation medal. Participants of the 5 km Walk will receive a participation medal too. The individual awards(Trophies) are assigned to the first 3 classifications of each age groups( General M/F , Senior M/F, VET 35 M/F, VET 40 M/F, VET 45 M/F, VET 50 M/F, VET 55 M/F, VET 60 M/F) and the top three teams will also be awarded a trophy. There will also be a trophy for the most numerous team. The awards will be delivered in their own ceremony. 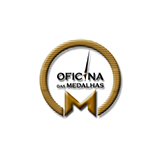 The obtainment of the awards is valid only and exclusively on the day of the race. The Walk in the distance of 5 km will not have competitive character. It is open to all participants, with no age limit. 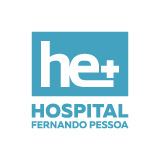 All participants are entitled to the Participation Medal, Technical T-Shirt, Dorsal, Water, Sports Insurance, Certificate of Participation, Massage and medical assistance of the Fernando Pessoa University Hospital-School. 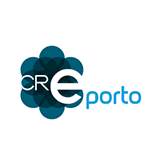 EventSport - Rua António Correia de Carvalho No. 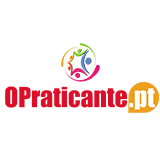 88 Store 36 4400-023 Vila Nova de Gaia. DentalDoctors - R. 25 de Abril 175, 4420-356 Gondomar. -Cash enrollment at the following locations (Eventsport) ends on June 6th after this date, registration will be made at the place of delivery of kits at Parque Nascente shopping center. Registrations can also be made on the day of obtainment kits. (The registration fee plus a late fee of € 5.00). The organization may extend the deadline for registration and even allow registrations for the event at the place of delivery of kits, if the maximum number of subscribers has not been reached, at its discretion. In this case, the registrations will have an addition of € 5.00 to the current value. The organization reserves the right to make promotions that change the prices of the registrations (discounts), as well as contests of offerings of inscriptions, whenever it wishes. Participants of the Walk 5km must wear the Technical T-Shirt and Dolsal provided by the organization. The organization reserves the right to accept proof of any registration. 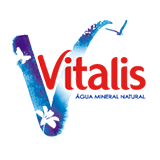 Entries can be made individually or on behalf of clubs, associations or companies. All athletes and walkers have sport insurance. Obtaining kits should be done individually. The registrant must present his / her personal identification and proof of confirmed / paid registration. Participation kits of third only will be delivery upon apresentation of original documentation. Participation kits will not be delivered on the day of the event (except for participants who live far away and who request the organization in advance). After the end of race and walk there will be no delivery of kits, Technical T-shirts or any other gift. The dorsal received in the runner kit (21 Km and 10km) must be affixed to the front of the Technical T-shirt, and must not be removed until the finish line is exceeded, otherwise there will be disqualification. The supplied chip is non-transferable and must placed in both running shoes, as instructed in the obtainment of it. Note - The organization does not provide pins to attach the dorsals..
- The organization guarantees the sports insurance required by law, in favor of all registered non-federated participants. In case the participant resorts to a National Health Service Institution, due to his / her participation in the race, he / she must inform the organization as soon as possible to activate the sports insurance, incurring a risk that the process will not be accepted by the insurance company if this Notification is not made in a timely manner. Payment of the fees is the responsibility of the participant, and can be reimbursed by the insurer if the process meets the necessary requirements. - The organization is not responsible for the poor physical condition of the participants or for any accident or damage that the athletes may cause or suffer before and after the event, exempting the organizers and sponsors of any legal action. - Any claim will only be accepted in writing, if made up to 30 minutes after the disclosure of the test results, by the deposit of € 100. - In the race there will be time control performed by chip (electronic timing) along the route. 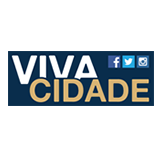 - The timing and classification of the race is the responsibility of the judges and timekeepers of the Regional Arbitration Council of the Porto Athletics Association. 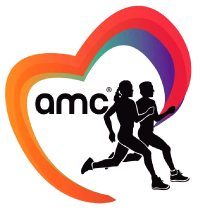 - All participants who commit one of the following infractions will be penalized: they do not complete the course in their entirety; Do not carry out the initial control; Do not carry the dorsal to the chest and well visible during the race; Falsify any element relating to their registration; Run without a T-shirt; Run with the dorsal in incorrect terms, run on the sidewalks; Comply with the organization's instructions. - For the sake of safety, during the race all the Runners shall remain exclusively on the right lane and on the official race course. 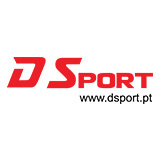 - Any irregularity or unsportsmanlike conduct committed by the runner shall be subject to disqualificationToda irregularidade ou atitude anti-desportiva cometida pelo corredor será passível de desclassificação. - Arrival control will be closed 3 hours after the start of the race. - Only the cars of the organization and the vehicles of the security forces can accompany the race. - In the event that there are no technical and / or safety conditions to perform the event, the organization reserves the right to transfer or cancel the event, which will be taken on the day of the event. - The organization of the event is not responsible for any accidents that occur with the participants BEFORE and AFTER the race, and all measures will be taken for the safety of the athletes. - The security of the event receives support from the competent agencies and there will be monitors (staff of the organization) for the orientation of the participants. - By participating in this event, the runner assigns all rights to use your image, waiving the receipt of any amount that may be earned with television rights or any other type of transmission and / or dissemination, promotions, internet and any media in anytime. 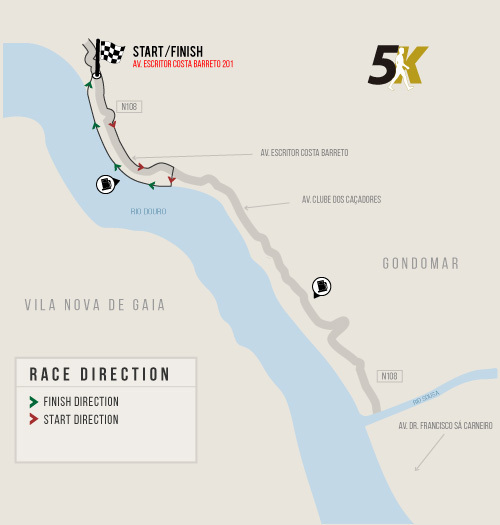 - The access to the areas of concentration and start will be signaled, being prohibited to skip the grids that delimit these areas of the race at the time of departure or at any other time, under any pretext. - The organization of the event, as well as its sponsors, shall not be liable for prejuize or damages caused by the runner registered in the event, either to the public patrimony, to third parties or other participants, being those of sole and exclusive responsibility of the author. - The organization may suspend the event for any matter that endangers the safety of participants, as well as public acts, vandalism and / or force majeure. - Cancellations are not allowed, and only subscriptions may be made. - Registrations may terminate when the organization so wishes for security reasons or for any other reason. 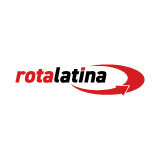 - Classifications may undergo changes after final confirmation of all times and ages groups. 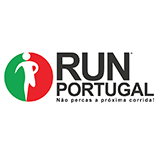 - All participants (after registering) assume this regulation.- The cases not covered by this regulation will be resolved by the Technical Director of the race and in accordance with the official regulations of the Portuguese Athletics Federation.